This vegetation line represents the trend of annually stable significant vegetation on beach faces in Hawaii for the islands of Kauai, Maui, and Oahu as identified using digital 0.5-m orthorectified aerial photography dating from 2005-2008. This is a proxy for where state agencies measure their construction setback from and thereby represents current coastal conditions. Data produced in 2012 by the Coastal Geology Group (CGG) of Dr. Charles "Chip" Fletcher at the department of Geology &amp; Geophysics (G&amp;G) in the School of Ocean and Earth Science and Technology (SOEST) of the University of Hawaii at Manoa. Data compiled by the Pacific Islands Ocean Observing System (PacIOOS) for the Hawaii Sea Level Rise Viewer hosted at <http://pacioos.org/shoreline/slr-hawaii/>. Not to be used without permission. Users of these data should cite the following publication: Romine, B.M., Fletcher, C.H., Genz, A.S., Barbee, M.M., Dyer, Matthew, Anderson, T.R., Lim, S.C., Vitousek, Sean, Bochicchio, Christopher, and Richmond, B.M., 2012, National Assessment of Shoreline Change: A GIS compilation of vector shorelines and associated shoreline change data for the sandy shorelines of Kauai, Oahu, and Maui, Hawaii: U.S. Geological Survey Open-File Report 2011-1009. 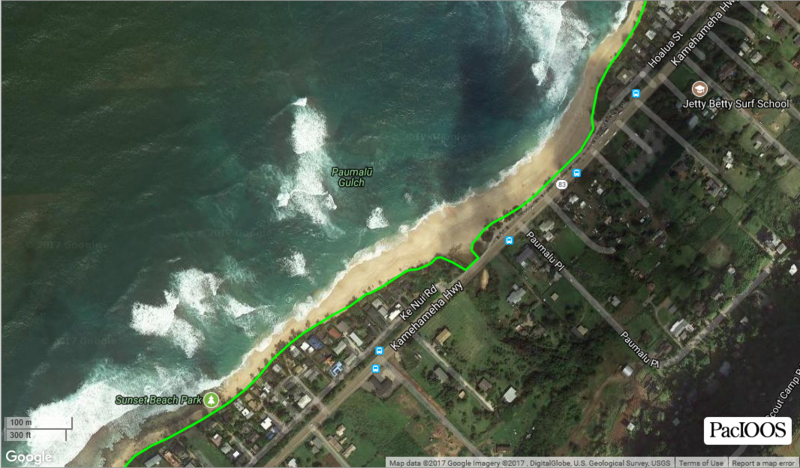 SLR Vegetation Line - 2005 - 2008: This vegetation line represents the trend of annually stable significant vegetation on beach faces in Hawaii for the islands of Kauai, Maui, and Oahu as identified using digital 0.5-m orthorectified aerial photography dating from 2005-2008.